Based on a few questions around my last post, the following is the prescribed methods used to test the speed of different chargers and cables. The software used is called Ampere, free from the Google Play store. The phone was discharged to 20% each time, using youtube. If a charger or battery pack had two ports I tested it once with no second device and then a second time by plugging in a discharged battery pack into the second port on the highest amp rated cable I could find from my cable test. Each cable and charger was tested with each cable to assure there were no outliers from incompatibility between the charger and cable. To my surprise there was only one deviation to the data related to the Apple 10w iPad charger. 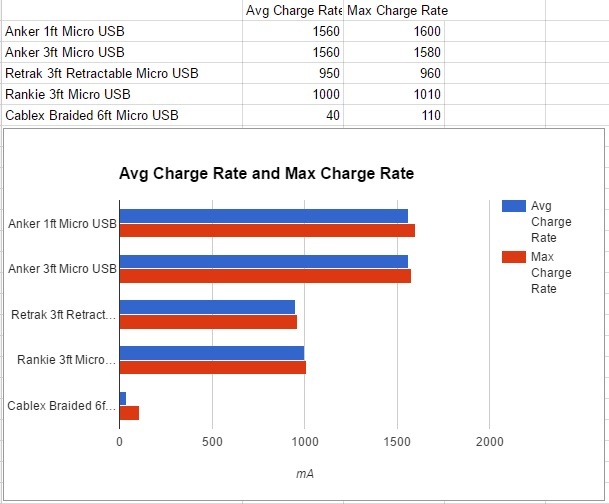 The Apple 10w iPad charger only would provide 500mA to any microUSB device or cable plugged in. The smaller Apple iPhone charger (rated 1amp) would consistently provide 1500mA. I am left to speculate that the iPad charger defaults to a 'safe' low power mode to protect the device if it can't negotiate properly with an MFi (Made For i(Phone/Pad/Pod) device, probably to prevent damage to iDevices that are being charged with a defective or non-Apple certified cable. 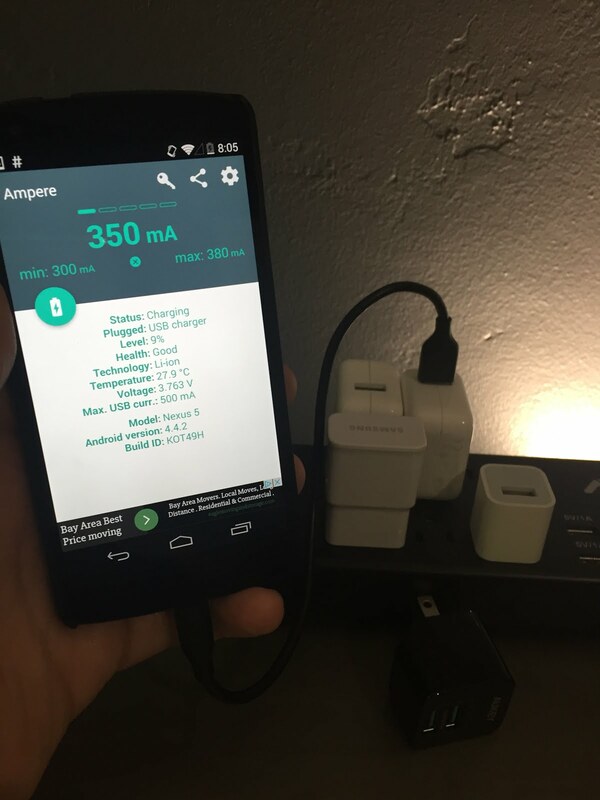 If you have devices that are Qualcomm Quick Charge 2.0/3.0 compatible you may see different speeds based on the negotiated rapid charge technology, this feature was not test. Some of the batteries and chargers supported this mode. I would love to see someone duplicate this experiment with a USB-C compatible phone. There is no app for iPhone/iPad that shows this data, so conclude the best cable it was based on elapsed controlled charging while in airplane mode, discharged to 20% and recharged to 80%. The phone used was a iPhone 6. Lightning cables were also ranked based on overall feel, as aesthetics for iPhone users is typically higher (don't worry this ended up not biasing the results at all, as the cables that scored highest on feel also performed the best). 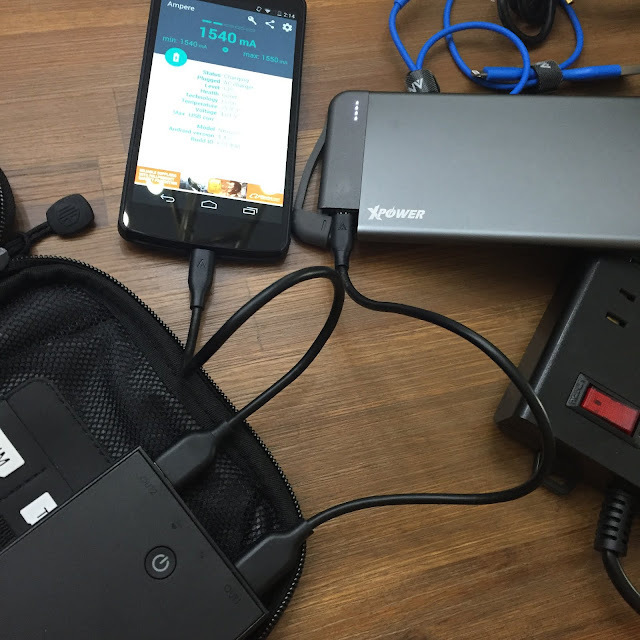 AUKEY 16000mAh battery pack charging both a Nexus 5 and a Xpower battery pack.